3 In 1 Dehumidifying Dryer (Energy Saving)_Dongguan Hengju Machinery Equipment Co., Ltd.
1. The 3 in 1 compact designed for dehumidifying dryer assures that the drying process is operating in the entire sealed system, avoiding to humidify again the raw materials contacts to the air after being dried, achieving as good drying results. 2. Microcomputer P.I.D control system, with protective functions of over-heat protection, motor overloaded, motor reverse protection, delayed cooling downtime. 3. Alternative for touch-screen liquid crystal display, are available to display operational conditions, trouble shooting and maintenance instructions. 4. Low dew point reach -40℃ to ensure materials drying completely by dried air. 5. Downwards blowing design to prevent heat loss and increase drying efficiency. 6. 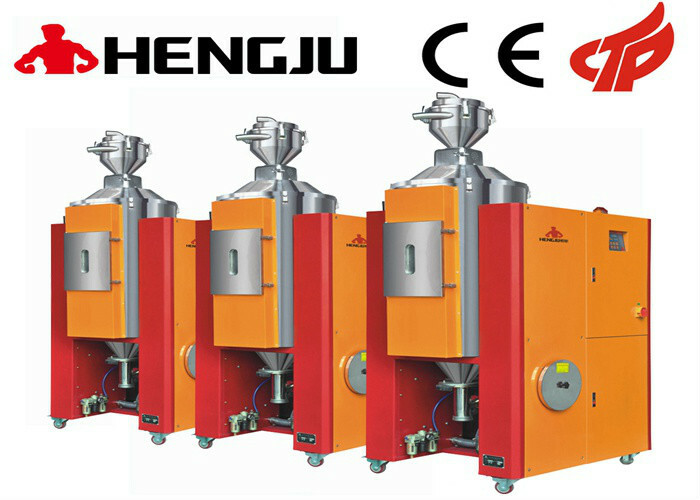 Double insulating hopper prevents heat loss and maintains regular temperature. 7. With advanced technology,provides safely,reliable,space-saving and high performance.